Get Inspired with Creative Wedding Gifts! So you are going to a wedding and you don’t know what to get the bride and groom as a wedding gift!? A toaster is too predictable, his and her iPads are too expensive. We have the tricks of the trade for coming up with thoughtful and creative gifts for the bride and groom that they will sure appreciate and will not break bank. DIY gifts are the best way to save you money and to show the newlyweds your creativity and thoughtfulness. These simple coffee mugs below are perfect DIY gifts that will cost you less than $10 to put together! Wrap them in some pretty tissue paper and put a glitzy bow around the box… click on the picture to see how this is done! Be sure to check out the always famous Things Remembered for some cute personalized wine glasses, or engraved picture frames. 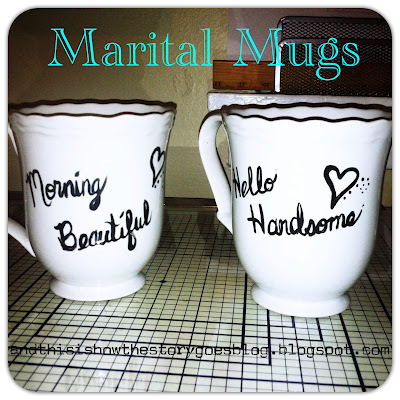 The bride and groom will feel so loved receiving something customized with their names on it. Of course we saved the best for last. For all you sentimental wedding-goers, you’re going to want to give the bride and groom something that they can cherish forever. So here is the mother-lode of all things sentimental! This would be a great gift as a maid of honor or groomsmen, or a really close family member (someone who would have access to the vows ahead of time). Have his and her vows inscribed on a canvas or to go inside a picture frame. When the newlyweds open these up, it will make for an instant, “Awwwwwww.” If you can’t manage to get your hands on the vows ahead of time, these gifts would be a great afterthought. Just when the bride and groom think the wedding-gift season is over, they will be pleasantly surprised when they receive these sentimental treasures. Have fun checking out the fun links and pics! ENJOY!! !